I must have a thing for bulletin board boards in my house. I keep finding more of them every time I go on one of my cleaning fits...I mean don't you all find random things when you start cleaning and organizing like a crazy person? Anyway that's besides the point, the point is I found another one last night and I think its the next victim due for a makeover in my house. Its an old frame found in the basement of my Grandparents house that ended up in my closet and it needs an upgrade now. Of course I had to go online for some inspiration and found some great ideas. I did the board above for my kitchen with another closet score with just burlap and some left over nailheads from my chair project. I think my favorite might be this framed ribbon board. I love how all the ribbon is all over the board creating a piece of art in itself. 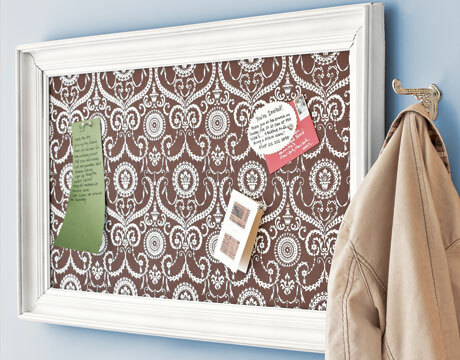 How do you like your cork / ribbon / tack / bulletin / message board to look? love the ribbon one!! very cool! I'm in love with that first office shot! That wallpaper/chair combo is wow! I also dig that last board with the ribbon. 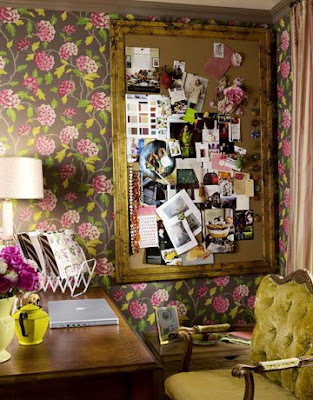 I love the idea of a really ornate/fancy frame with pics and tix and cards tucked in. In my art studio, I want a wall of inspiration to switch out seasonally. I think a wall of cork or magnetic would suit me fine. I love them too. I would have them in almost every room. They are a perfect way to organize! The last frame is stunning too, with all that ribbon! love, love and love. can't wait to see what you come up with. that brown with the pink is fab! love the ribbon frame - the whole entry actually! 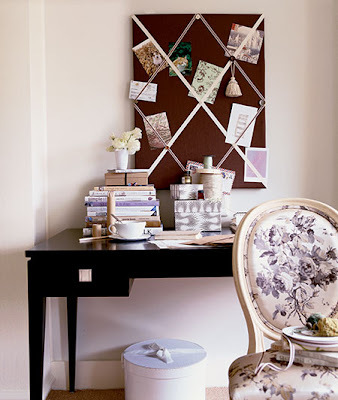 I love the idea of framing the board.. makes it chic. Mine is just covered in pics, tickets, rip outs from mags, etc. Inspiration and memories! Janell I'm glad you did too- love your blog! Love the Last one. Sooo different and an updated twist on the ribbon corkboard concept!! i love bulletin boards! i still have my from h.s. hanging in my old room at my parents house. i love looking at it every time i go home. great idea about the re purposed frame! Love these! 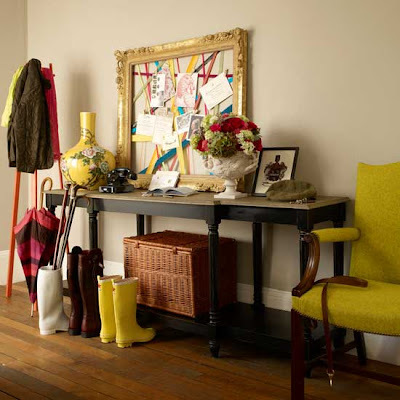 Love the first one and the nailhead! I love the first and last image. Love this. Awhile back I made a magnetic chalkboard and framed it in a decorative white frame. But, in the long run it didn't end up working out. Thanks for the idea's maybe I'll try making one of these. Love the first one and the board you did. I've been looking for an ornate frame to make a burlap board with. Great inspiration. The ones with the more ornate frames jump out at me the most. They somehow manage to look less "messy" and more "inspired". I remember loving the one that you made, but I adore all these images for their personal feel. I love the idea of ribbons too! I am with you, love the ribbons. I could never pick just one...maybe that's why I'm always changing mine. I have a nailhead one, but I'm lookin to make another...I think the different colored ribbons is so much fun. I would be very happy working in a version of the first image! Love your burlap board!!! The ribbon one is fun. Love the ribbon board! 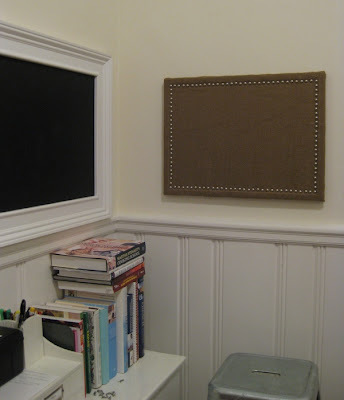 I just made a bulletin board for my office at home using fabric and a frame and I like it but I want to go the fabric/ nailhead route for the next one I make. It will go in my office at work. So many options!